This week it’s Sara Chardin who took part in The Westonbirt House Christmas 10K with us. 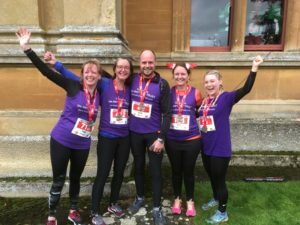 ‘Our team from Stroud District Council ran The Westonbirt House 10k to raise awareness of the dangers of nut allergies, while raising much-needed funds for the Amy May Trust. The Trust has been set up to help fund the continual rehabilitation and medical needs of Amy May Shead, who suffered a severe brain injury through catering negligence, as a result of a nut allergy. Our team is made up of Sara Chardin, Emma Blomfield, Helen Johnstone, Pippa Stroud and Ian Bird. The reason for running is a personal one as Amy May Shead’s is my cousin. Amy managed her severe life-long nut allergy with care, but didn’t let it stop her living life to the full. She was a talented producer on ITV’s This Morning. On a weekend break to Budapest in 2014, she took the first bite of a meal, which she was assured didn’t contain nuts. She immediately experienced a catastrophic anaphylaxis reaction, which led to cardiac arrest. As a result, Amy sustained a severe brain injury due to being starved of oxygen for six minutes. During the three years since the incident, Amy has progressed slowly, but surely, from being in a coma in ICU in a London hospital, via a neurological rehabilitation hospital to a specialist care facility in Essex. The next move planned for Amy will be to live with her parents, who are in the process of adapting a new home. Due to the restaurant in Budapest not holding public liability insurance, and travel insurance not covering her lifelong condition, there is no compensation for this life-changing and devastating tragedy. The Amy May Trust has been set up to fund the much-needed therapies (speech and language therapy and physiotherapy). Amy is unable to communicate, but it is clear she understands everything that is going on around her. Sara has seen for herself what a visible difference these treatments are making to Amy’s life.